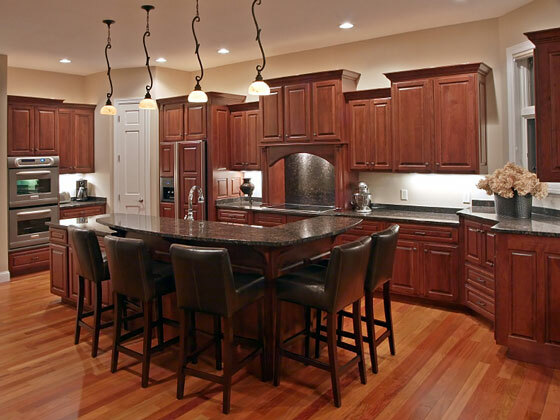 Choose your cabinet style and then design your kitchen with cabinets using different heights, depths, finishes, and trims. Cabinets from any price range can be arranged or trimmed to personalize your kitchen so you will love to live in and use it. Why have a monotonous, door-after-door arrangement? Combine cabinets of different heights and depths. Place a taller cabinet in a row of wall cabinets to give it prominence. Put a deeper cabinet over the refrigerator and box in the refrigerator for a built-in look. A cabinet shallower than the standard 12 inches deep wall cabinet adds interest to a wall of cabinets that are all the same. Add a plate storage rack, cubby holes, or small spice drawers beneath a shorter cabinet. Or just have a few cabinets without doors, and use them to display books or dishes. 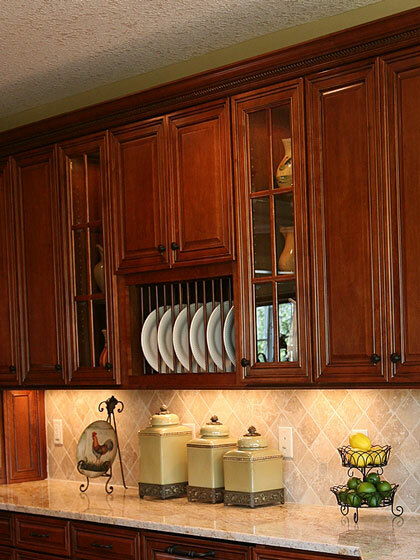 Finish off the tops of varied height upper cabinets with handsome trim or crown moldings. For the baker, choose a lower height base cabinet and top it with butcher block or marble. Inset between other standard height base cabinets, it is the perfect height for rolling out dough. Use wide drawer base cabinets instead of cabinets with doors for pots and pans. Pull the sink cabinet forward a few inches and make the countertop deeper. Choose cabinets in two different colors or different door and drawer styles. Add legs or feet to the sides or kick space of base cabinets for the unfitted look of furniture. Make an island stand out from the other cabinet areas using these techniques. Overall, incorporate these cabinet ideas into a kitchen layout that functions well. Install the cabinets so there is good traffic flow with room to maneuver. 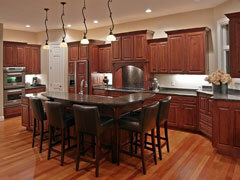 Place appliances and cabinets allowing enough counter space for ease of preparation, cooking, and cleanup. Bon Appetit!